That’s a recipe my mother cooks nearly perferct. 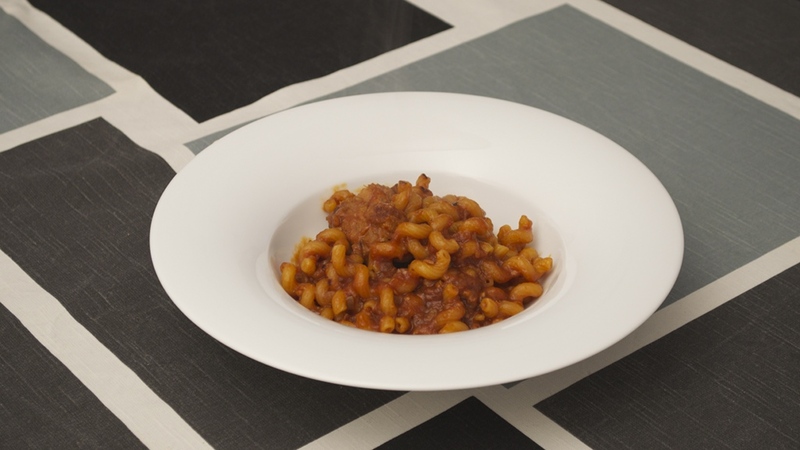 It’s a very typical recipe in Catalonia and the translation I did is a bit free, in Spanish is named fideos a la cazuela. Let’s start chopping 2 onions. You can use canned tomatoes, but at this time of year you can find nice tomatoes on the market so I prefer to peel the tomatoes (about 800 gr), add them on a blender cup with 4 garlic cloves, a teaspoon of sugar and blend them. On a pot add a bit of olive oil and then the pork ribs cut in pieces large like your longest finger, adding salt and ground pepper. Simmer the pork ribs in the pot for about 50 minutes , stirring frequently and adding a bit of water if they start to stick to the pot. It’s nice if they stick just a bit, as they get a nicer color and caramelize a bit. After 50 minutes add the 2 chopped onions and stir frequently, simmer the onion for about 15 minutes until it’s not dropping more water. Then add the tomato sauce, move a bit and taste if you need to add salt and sugar (if it tastes too acid a bit of sugar will help). Simmer the tomato for 10 minutes and add the noodles, in this case I added Cellentani which find very nice because it’s curled shape. Cook until the pasta is soft and check frequently if you need to add some water. Some days ago taking a look on my old bedroom on my parent’s house I’ve found a book by Giuliano Hazan, The classic pasta cookbook, truly an amazing book teaching you how to make fresh pasta yourself, as well as most popular italian sauces and a lot of recipes with pasta. And this catch my eye for unknown reasons, maybe because I like to cook with lemon, who knows? The result is really amazing and straightforward to cook, unfortunately it’s not a good idea to eat it every day because it has a considerable amount of fat. So let’s start adding about 50 gr of butter on pan, better cut in small cubes. When butter is melt add the juice of one lemon as well as lemon zest, cook the butter with lemon for about half minute. Then add about 100 ml of cream milk and cook until the sauce reduces to less than half of it’s initial volume stirring some times. Reserve the sauce and cook the pasta in boiling water with a bunch of salt. When pasta is cooked drain it and add to the pan back to fire stirring to mix all well. Finally add some grated parmeggiano cheese and optionally fresh chopped basil and ground pepper. This recipe was possible due to a lack of ingredients one sunday night. I remember I had some mushrooms on the fridge so I put my imagination to work and end up with this. It’s quite interesting because except for the shiitake mushrooms (which you can replace with another kind of mushrooms) all other ingredients are quite common on your storeroom. Start cutting in very small pieces about 200 gr of shiitake, or another kind of mushrooms. Chop one onion. Add a bit of oil in a pan, and put on the heat a large pot with water. Add the chopped onion and shiitake in the pan as well as a bit of salt. Stir frequently. Shiitake or mushrooms will drop some water, wait for the water to be almost evaporated and then add 2 crushed garlic cloves, stirring and cooking for about 2 minutes. Then add the crushed tomatoes , mix well and stir frequently. You need to maintain in the heat until the sauce gets the consistence you want, normally about 8 to 10 minutes. When the water is boiling add a generous amount of salt, and then the pasta and a bit of olive oil or butter. Cook the pasta the amount of time indicated on its package. Then strain the pasta and add to the pan, so the pasta get the flavor of the sauce. You can spread over some fresh chopped basil and or grated cheese. 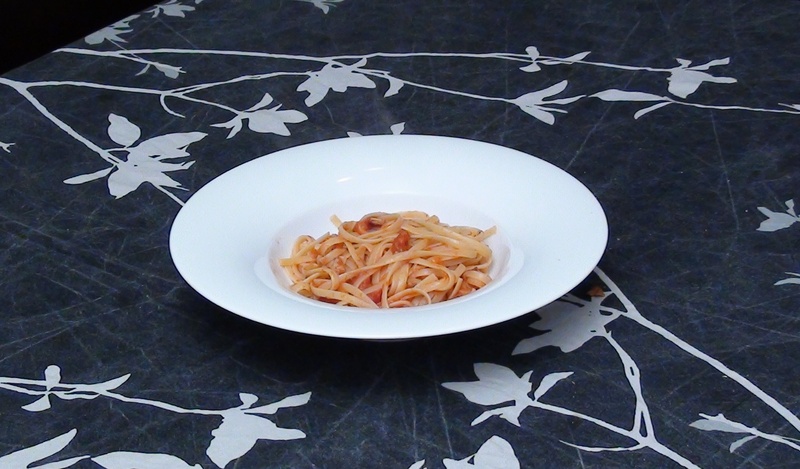 This is a very simple recipe, it will take you no more than ½ hour. For me it is a great dish for a supper. Let’s start removing the skin of salmon, as well as spines. Then cut the salmon in small cubes. Chop an onion. And finally we will cut in small pieces one tomate and grate another one, in order to do it easier cut them in half and cut in small pieces the parts without peduncle and grate the other parts until you get only with the skin. But be careful and don’t grate your fingers! Put on the heat a pot with water and add salt. 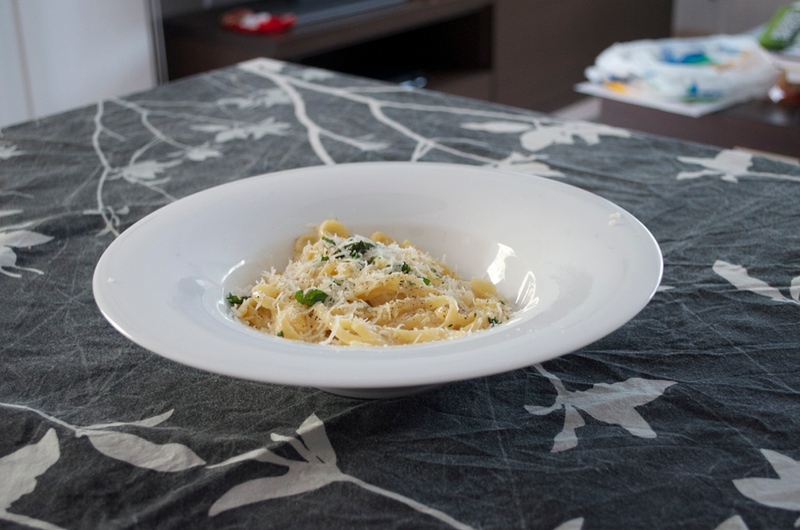 When water is boiling add olive oil in a pan and add the pasta in the pot, adding a bit of butter or olive oil. Cook the pasta the amount of time indicated in the pasta box. Maintain the heat on the pan at minimum and add the onion and a bit of salt. Stir frequently. When pasta is at half of its cooking time, add to the pan the salmon, 2 crushed garlic cloves and the tomatoes, and again stir them frequently. When pasta is cooked add a bit of butter in the pan and let melt while you strain the pasta. Finally add the strained pasta in the pan, stir and mix for a couple of minutes and your dish is finished. Start cutting one red pepper in half, remove the threads and cut on to stripes. Cut the stripes on half. Add the red pepper on an oven tray, add salt and cook in the oven at 350ºF (180º C) for ½ hour. The original idea was to use the liquid drop by the pepper while cooking on the oven for preparing remaining steps, but this pepper didn’t drop enough liquid. Once the pepper is cooked have a pot with boiling water and add olive oil in a pan. When oil is hot add laminated and clean mushrooms in the pan, add salt and stir. Then add salt and the pasta in the pot. Stir the mushrooms frequently and add more oil if the pan gets dry. After 5 minutes add 3 garlic cloves sliced, 5 – 6 cherry tomatoes cut in half and the eels and mix all. Cook for 3 minutes, then add the red pepper mix well and drain the pasta. Add drained pasta on the pan mix well and you’re done. 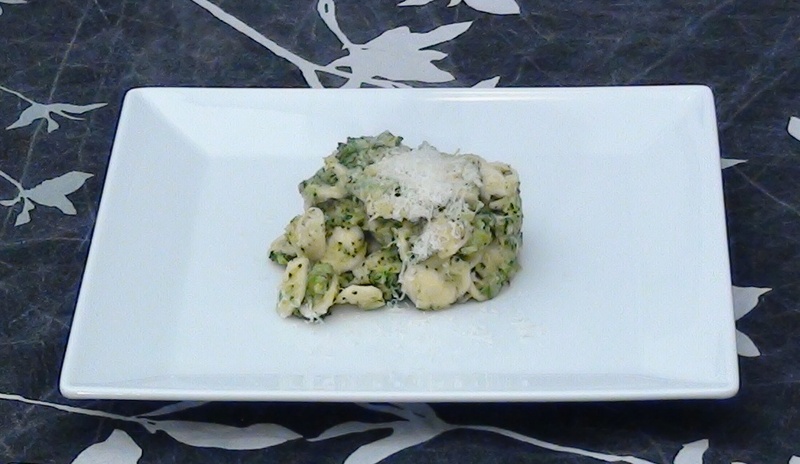 I’ve tasted orecchiette for first time at Milan when I was working there, so this recipe remember me those days, but just for the pasta because never tasted (unfortunately) this recipe. 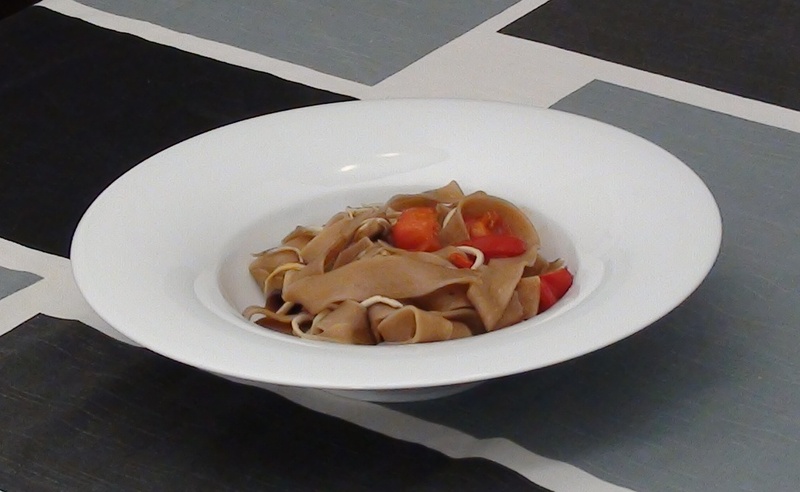 Without anchovies this will become a great vegetarian recipe. Cut the broccoli placing the edge of knive near to those tree shape bulbs. Don’t throw away the rest of broccoli, put them on a blender and add 2 garlic cloves, a tin of anchoives and 2 small spoons of capers. Blend it well. Put watter on a pot, and when is starting to boil add a bunch of salt and the orecchiette. After 5 minutes add broccoli to the pot, and let cook for 10 minutes. 5 minutes before broccoli and pasta are ready and the blended mix on a pan with hot oil. Move to avoid it to get stuck to the pan. After 2 minutes add 2 big spoons of water from the pot where broccoli is cooking. When broccoli is ready, strain add add broccoli and pasta to the pan. Add grated parmesan cheese, and cook while moving for a couple of minutes. After serving you can add more grated parmesan cheese. With winter getting close it’s a good time to start preparing hot dishes, like this chicken soup. Chicken soup will bring you a nice dinner at night, but also stock chicken which can be used as another ingredient in some recipes. An onion in about 8 pieces, a garlic head just cut in half, 2 or 3 celery branches, one leek, half pumpkin. On the pot wi will aslo add salt, rosemary and thyme, and then cover the vegetables and chicken carcass with cold water. Once water starts to boil let the stock on the fire about forty five minutes. Use the stock to cook pasta, add more salt if needed and you have ready this chicken soup. 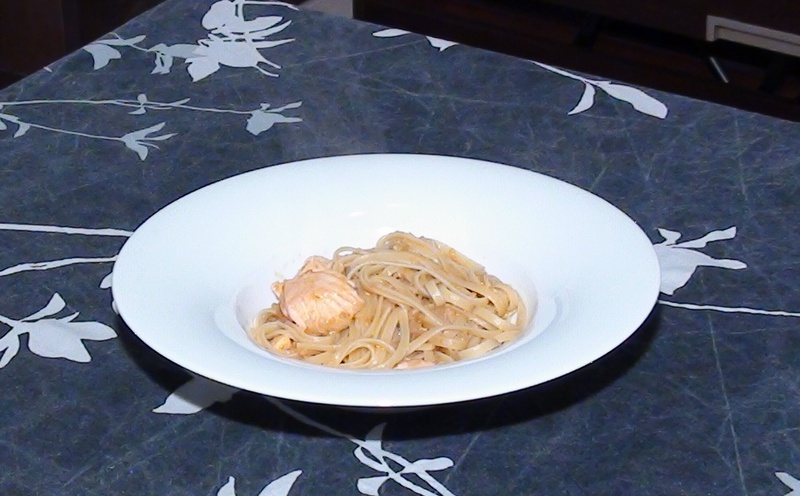 If you replace the chicken carcass with some prawns heads, the rests of some other fish you can make a fish stock, and cooking the pasta with the stock and the prawns you will get a really nice fish soup. Finally once you test the recipe for first time you will prefer your soup to be more flavour concentrated or less, just increase the amount of vegetables if you want stronger flavour or decrease if you want it lighter. Hope you like this recipe, see you soon!